What’s the difference between deep tissue and firm pressure massage? We’d like to give you a clear explanation of what true deep tissue massage is and how its purpose is quite different than that of a Swedish-style massage delivered with firm pressure. To understand this difference, it’s helpful to first think of the body’s fascia and muscles in layers. Notice in this image on the right the many overlapping Muscle layers layers of these tissues. Fascia is a connective tissue which permeates the entire body – literally holding the body together, wrapping around every muscle, nerve, organ, blood vessel, and bone. These wrappings are all interconnected in a three-dimensional maze. 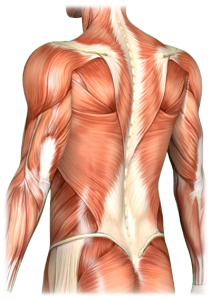 The muscle layers run superficial to deep in the body. Epsom salt bath: Although there is not much in the way of scientific evidence to prove the efficacy of an Epsom salt bath for reducing muscle soreness, plenty of people report that their aches and pains are alleviated significantly after a good salt soak. Pour 2 cups into a warm bath and soak to your heart’s content. Avoid strenuous activity, but a mellow walk may help to adjust your body to the changes in the tissue and joints. The result of a good deep tissue massage is often significant pain relief, greater freedom of movement, and a more fluid sense of balance in the body. Depending on the primary technique your therapist uses, you may or may not need to undress. Only undress to your level of comfort, for a full body massage, most people undress to their bottom underwear. However, you may choose to undress completely or keep some of your clothes on. Your massage therapist will give you privacy to undress, and you will be covered with a sheet and blanket at all times except for the area being worked on. Make yourself comfortable. Try to concentrate on your breathing and the sound of the music. If you feel any discomfort or would like more/ less pressure, do not be afraid to speak up. If your therapist wants you to adjust your position, she or he will either move you or will ask you to move what is needed – you do not need to help with the movement. Otherwise, change your position anytime to make yourself more comfortable. Many people close their eyes and relax completely during a session; others prefer to talk. It’s up to you. It is your massage, and whatever feels natural to you is the best way to relax. Do not hesitate to ask questions at any time. During some deep tissue techniques, there can be a significant amount of pressure that may be on the verge of uncomfortable – it is best to breathe deeply during this technique to help the muscle release. If something is painful, please let your therapist know. We use a hypo-allergenic gel with apricot and grapeseed oils for most massages. If you have sensitivity to any types of oils or lotion please bring it to the massage therapist’s attention so we make sure to use only hypo-allergenic.